A photograph has surfaced showing an individual holding what looks like a dead troll like creature. Apparantly, as the story goes, the locals saw one of these creatures foraging for food. They shot at it, at which point it ran in to the woods. The locals, in the Republic of Namibia gave chase and soon reached it’s lair where they encountered three others. The original creature then attacked one of the locals at which pount the creature was then shot and killed. According to reports, the creature was taken away by local police for a full forensic examination. It is important to note that the validity of the story has not been verified and the General consensus amongst the chatter on the forums is that the creature is merely a dead baby with servere deformaties. Others have suggested a heavily photoshopped image. BRIT explorers claim they have spotted a legendary ape man believed to inhabit an island jungle — and snapped its footprints. The four-strong team and their Indonesian guide were tracking through dense jungle in Sumatra when two of them caught a glimpse of the famous Orang Pendek — or short man. The group brought back a hair sample and a piece of chewed palm from the island’s Kerinci National Park they hope will provide DNA evidence of the beast. They also snapped a strange footprint thought to belong to the creature. Sightings of the hairy human-like monster have been made in the area since colonial times — and it is alleged to be immensely powerful. The explorers hope the sample of rattan palm, which is thought to have been munched on by the Orang Pendek, will contain some of its cells. The palm and hair sample have been sent for testing. Witnesses have described the beast as being about 5ft tall and say that it walks on two legs. It is thought to be extremely powerful — with reports of onlookers seeing it ripping apart logs. After a spate of sightings around Lake Gunung Tuju, in the Kerinci national park, a team from the Devon based Centre for Fortean Zoology — which investigates unknown species of animals — embarked on a two-week mission to the region to see if they could obtain evidence of the creature. The elusive Orang Pendek shares its habitat with the Sumatran Tiger, pythons, and Saltwater crocodiles. Richard Freeman, the expedition zoologist and zoological director at the Centre for Fortean Zoology, said he believes the creature is an unidentified species of ape. “We are not talking about a unicorn or a griffin, we are talking about an ape that’s unknown to science,” he said. “It’s name means ‘short man’ in Indonesian. “It’s supposed to be a powerfully built upright walking ape. “It walks on two legs rather than four – like a man, about five foot tall with dark fur – immensely strong. “It’s been seen since colonial times. The team, who have just returned from their two-week expedition, hailed it a success and are awaiting the results of the DNA tests. Here is an interesting report from the All news Web. Its dated 29th August and written by Michael Cohen. “Making big news in China this week is a story about Himalaya’s legendary Yeti or Bigfoot. For centuries rumours of a half-man, half-ape that roams the upper Himalayas have circulated. The creature said to stand 3 metres tall has been allegedly seen by many locals as well as hikers visiting the area. In Chinese Yeti is often referred to as ‘Xueguai’. A number of locals living near the Nepalese border claim not only to have seen the creature, but to have collected strands of its hair. Now, it has been reported that a team of scientists have collected these strands and have already confirmed that they do not belong to any local known animals. The scientists plan to do further testing on the hair strands. More excitement regarding Yeti Hairs. Deos the Yeti suffer from Split ends? Could the mystery of the Yeti finally be solved? A few hair strands supplied to the BBC by a napalese man have proven impossible to identify. Dipu Marek found the hairs deep in the jungle after a forrestry worker had seen the yeti on three conseqative days. In England, highly sophisticated microscopes were used to examine the hairs and by a process of elimination the indiginous animals of that region were discarded as being the source. The tests were carried out at Oxford Brookes University in central England with award-winning primatologist Anna Nekaris and microscopy expert Jon Wells from the university’s anthropology department. Ian Redmiond a primatologist and senior consultant for the UN’s Great Ape Survival Project has said that the Hairs are ‘potentially very exciting’ and along with Nekaris, agree there is “every chance” they could belong to an unknown species of primate. Another exciting aspect is that the hairs contain identifiable follicles which means that there are cells present. As a result the hairs are being subjected to a more thorough DNA analysis. Just watched the first episode of a new series here in the UK called The Monster Hunter. The host is Josh Gates and in this weeks episode he travelled to Malaysia in search of an apelike creature that had been seen by various people. 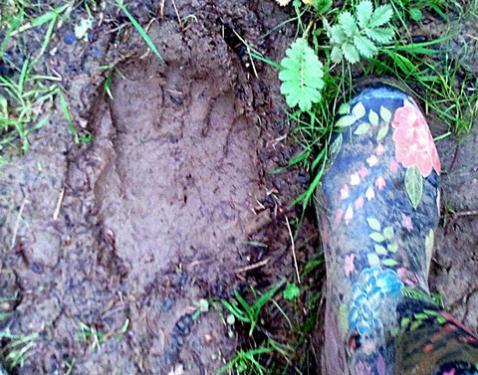 Gates and his film crew spent a night in the remote jungle and came back with a footprint of an unknown creature and a recording of a distant growling noise. All in all an interesting program. However, i did have a couple of reservations. Secondly, i found the fast frenetic editing very offputting. No scene lasted more than a few seconds before it jumped to the next, and Gates’ continous ramblings did begin to get a bit annoying.